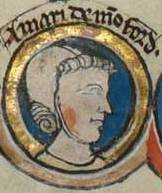 Amaury de Montfort (1242-1292) was clearly the best educated of Simon and Eleanor’s children. He was eight years old when his parents sent him to Robert Grosseteste for an education. He also studied under Master Nicholas, one of the leading mathematicians of the day, and later attended the University of Padua. His works include a theological treatise written in graceful Latin and an alchemical tract that suggests he learned what passed for medicine in those days. Probably the last surviving Montfort son, he was marked out for a clerical career early on and made sure to note in his will all the offices he had held, from papal chaplain to canon and rector. It was during his father’s administration that Amaury was appointed to his most controversial position, that of treasurer of York, previously held by perennial Henry favourite John Mansel. The king not only annulled the appointment immediately after Evesham, but gave the office to the son of perennial Montfort foe, Roger Mortimer. Supremely vindictive and duplicitous as ever, Henry told Louis that the 11,000 marks Eleanor de Montfort took with her overseas included money embezzled by Amaury from the York benefice. Henry insisted he needed the money back in order to compensate French merchants who had suffered losses during the unrest, but Louis knew better and ignored his request. Of all the Montfort children, Simon’s rhetorical skills were best evident in Amaury. In 1267 he convinced Pope Clement IV, the former legate who had excommunicated Simon, to reverse his enmity toward the family. He seems to have been well regarded at the papal court and was no doubt instrumental in the lenient sentence imposed by Pope Gregory X on his brother Guy for the murder of Henry of Almain. Probably from Eleanor Amaury got his litigious nature. He sued Edmund Mortimer, son of the infamous Roger, to get the office of treasurer back, and was the executor of his mother’s will between her death in 1275 and the final settlement in 1286. He enjoyed needling his cousin Edward I, no more so than when he sued Edward’s brother Edmund to get back his father’s lands. Ordered by Edward to cease and desist, Amaury chided the king for his complete lack of grace and politeness, but agreed to drop the suit lest his cousin grew even more ill tempered. When Guy and Simon de Montfort murdered Henry of Almain in Viterbo, Amaury was lying bed-ridden in Padua with a fever, the worst of which had him at death’s door on the very day of the murder. Edward suspected otherwise and had Amaury seized as he accompanied his sister Eleanor to Wales to marry Prince Llewellyn. Amaury was locked up in the foreboding castle of Corfe despite the pleas of several popes and bishops. Swearing he had only good things to say about Edward, he was released in 1282 after four years’ imprisonment and ordered to quit the realm. He went to Paris, then to Montargis, where his mother was buried, and drew up his will, where his flourish of hereditary titles included the earl of Leicester and steward of England. It is likely he died there, on or about 1292, though it was said that he returned to Italy and became a tutor for Guy’s daughters. One account has him throwing off his clerical robes and becoming a knight. If that were indeed the case, it was probably only because he had already done everything else.